Hi loves! No nail polish today, instead I'm reviewing 2 nail care products from GERmanikure today! GERmanikure is a brand of high quality grooming essentials made by skilled craftsmen in Solingen, Germany. There are various products available and I'll be focussing on the cuticle nipper and glass file today. Before I received the items, I chatted a bit to Dave, a representative from Zamberg, the company that sells GERmanikure products exclusively. He explained to me that, while their products are made under proper ethical conditions in Germany (the glass files are produced in the Czech Republic), they are also paying the same amount of money it costs to produce a product directly to families in Pakistan and Vietnam that have been victimized by child labor. That's something to be proud of! The products arrived safely packed and well wrapped on my doorstep. Both the cuticle nippers and glass file have a protective leather case that fits snug and feels very soft, so you can easily take them with you if needed. GERmanikure cuticle nippers have a unique design to prevent dulling the blade by crushing them together too hard - you can see it all explained very clearly here. I really like that I am able to fully open up the nippers in order to clean them. While cuticle nippers are intended to nip cuticles, I never ever do so! I only use this tool to get rid of hang nails or the occasional dry bit of skin. The thin, tapered blades are really sharp and pointy so it's easy to just nip of that bit of skin you want to get rid of. 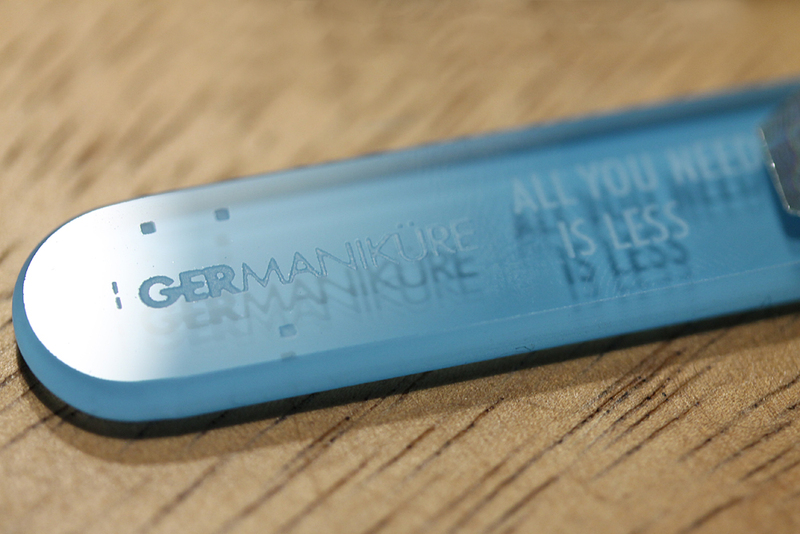 GERmanikure glass files are available in various colors and with various inscriptions - mine says All You Need Is Less. It's double sided and the top part is smooth and easy to hold. The other day I had to take of some length and the grit is coarse enough to work quickly, but fine enough that I don't need to use another file to smooth down edges after using this for the heavy work. I never ever want to use anything else than a Czech Republic glass file, the quality is SO good and they last you a life time. Just give them a wash every now and then to remove build up and pat it down. While I'd never use cuticle nippers the way they are meant to be used, I am happy to have such a high quality nipper for those pesky hang nails. It's easy to clean and the blades feel super sharp so I don't think they'll dull on me any time soon. Glass nail files are something I never have enough of. Because of the leather pouch I can take this one with me everywhere I go and I like that they are available with lots of fun sentences. Do you ever use a cuticle nipper or glass file? And what do you think of these products? Tell me in the comments! GERmanikure products are sold exclusively through Zamberg, international shipping available. Besides cuticle nippers and glass files there are a lot of other products available so be sure to take a browse through the site!